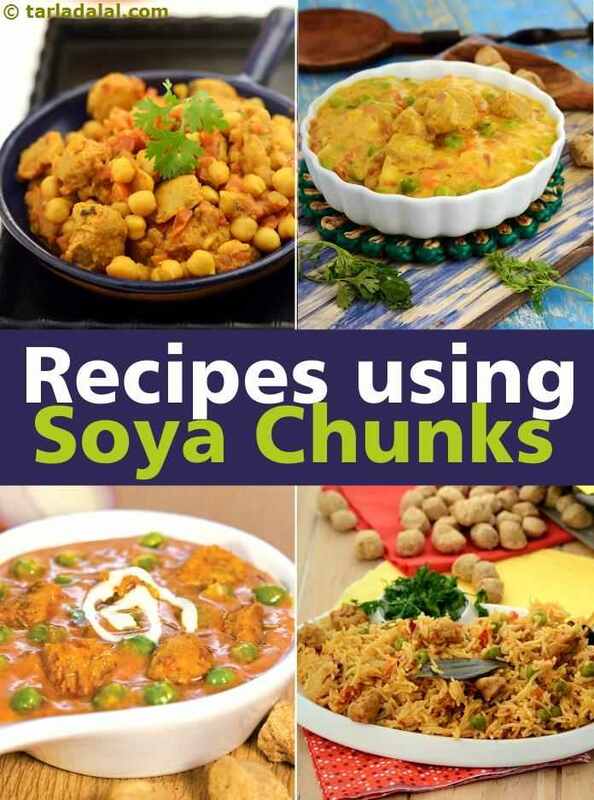 Soya chunk recipe collection. It is generally difficult for vegetarians to incorporate enough protein in their diet to meet their daily protein needs. Even though Indians have a regular intake of pulses and dals, there is still some catching up to do. This is where Soya chunks come in. Made from Soybean flour that is obtained during the process of extracting soy oil and then sun dried, these chunks not only are a rich source of protein, but also of calcium, iron and omega-3 fatty acids. Since the chunks are dry, they need to be boiled for a few seconds and then soaked in that water for 15 to 20 minutes while covered with a lid. Once the chunks are soft, you have to squeeze out the water from them and they are ready to use. One can even add salt while soaking these since they do not have any flavor of their own. Replacing certain vegetables like potatoes with Soya chunks adds nutritive value to your food while removing the extra carbs like in Rajasthani Style Kaddu Aur Soya ki Subzi wherein the combination of soya chunks and pumpkins really lift the dish. When combined with unique flavors like green peas and coconut, it yields a beautiful curry called Soya Mutter in Coconut Gravy that you can eat with phulka rotis or parathas. Another finger licking subzi you can make is the Shahi Soya Subzi where soya chunks are used in place of paneer in a rich and lucious gravy made of different aromatics and spices. If you want to make a dry subzi, you can make Panchkutiyu Shaak, a gujarati subzi with different vegetables and a base made of coconut and coriander. A lot of meat lovers out there who have turned vegetarian are always looking for substitutes to put in their food. By using soya chunks in Soya Mutter Pulao you are replacing the meat with the nutritious soyabean product. The chunks can also be used alongside chana and flavored with masalas to make Chana Soya Masala. Instead of using fried besan balls in Dapka Kadhi, you can impress a crowd with this innovative Soya Mutter Kadhi which also boasts of flavors from tomatoes and onions. Soya chunks in themselves do not have any particular flavor and hence can be paired with anything and it will absolutely adapt and absorb the flavors. One of the many ways you can utilize this characteristic is by adding the chunks to stir fries of various kinds, one of my favorite ones being Oriental Soya and Babycorn stir fry, which has a salty, garlicky taste and you can add any veggies to it that you want. You can also make Soya Tikkis in Malwani Gravy where the tikkis are made of soya chunks, potatoes and carrots and added to a coconut based gravy. If you don’t want to make the gravy then it is okay as well because the tikkis taste delicious in themselves. Soya nuggets, a variation of soyabeans, have been used in this recipe and cooked in a white gravy. The traditional use of cashews in this recipe has been substituted with cauliflower purée, making this a healthy gravy. Stir-fries are always on top of my list, when it comes to healthy cooking, to monitor the amount of fat used. I have chosen soya nuggets because of their decreasing nature of LDL (bad) cholesterol and baby corn to give the needed crunch without any amount of fat. Mixed vegetables and soya in a coconut based gravy a very thoughtful combination indeed! The dish can be cooked in very little time as all the veggies added are pre-cooked. Make sure the tomatoes are cooked well; otherwise the coconut milk will curdle.